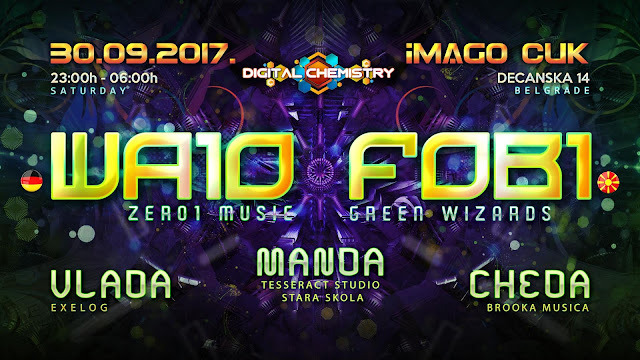 Psychedelic & Progressive Trance event. Many of his latest releases including his EP 'Symbolika,' and his single 'How To Psytrance' have reached the top of Beatport music sales charts, and continue to do so today with every new release. Each live set is created using his own unique software called 'WAIO CONTROL,' based on the Reaktor platform, and made exclusively to enhance his live performances; allowing him to craft each show into a unique, intelligent, psychedelic experience! Fobi is the musical project of Darko Velkovski, born and raised in Macedonia. He works in his studio in Shtip, transforming his inspiration and dreams into wonderful music. He started listening to psytrance about 1997, at one of the most amazing musical peaks in this music industry and was immediately captured by it. The music from that period is still very inspiring to him. After just listening to psytrance for about 3 years, Darko decided to kick things off himself and he started DJ-ing. Few years later (2002), he started his own personal project Fobi. With incredible dedication and discipline he wrote an endless amount of mind blowing tunes. His music has been described as a brilliant fusion between the more morning oriented melodies as well as the nasty sick growly noises that are so typical for nighttime psytrance. This man blends them both together in a delicious delicate mixture, which is guaranteed to propel you into an oozing orbit.